The setup of Meteos is simple and well thought out. There is a giant "Wireless" option right on the main menu for all of the multiplayer action (both Single-Card Download play and Multi-Card play). The "Demo Download" option is filed within the "Extras" option. While it might make sense to put it in Extras, it is a wireless feature. If only programmers could learn to put it in both! It's only a minor inconvenience, however. Both the Versus play and the Demo download quickly at about 20 seconds each. In most cases, the fields are large (or at least large enough) and react quickly. The menu options generally have big enough buffer spaces so that you don't accidentally tap the wrong option, but the menus move around a bit (see Hint #7). As you highlight an option, a line of text across the bottom of the upper screen describes it for you. The demo uses the upper screen of the menu for a quick instruction on how to play (very low depth, but very nice touch). While the blocks can be small, the game goes out of its way to highlight the column and double-highlight the selected block as soon as the stylus touches the screen so that you don't accidentally drag the wrong Meteos block. While the game can be played without the stylus, it really doesn't make any sense why you would want to. The stylus, once you get used to it, is quicker, easier, and allows you to go farther. It the G Touch Generations label had been around when Meteos was released, the non-stylus control probably would have been dropped out and Meteos would've qualified for the label. The blocks are designed to look like blocks. Nothing fancy. Nothing missing. Nothing wrong with it. The upper screen is best used to spy on your opponent in one of the Versus modes (the regular SCD Vs or the SCD Demo Vs). The sound is one of the highlights of the game. Each planet has its own unique music, which syncs well with the sound effects that are created by doing... well... anything! The action/music interaction is simply beautiful. You can play Versus mode in Single-Card Download with the win condition being either the number of wins or the most success in a preset time. You can send someone a demo, which they can take and walk away with and play on their own. 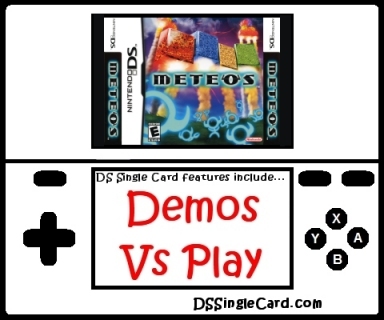 To show off even more, the programmers behind Meteos even set it up so that two people with doenloaded demos can play a Versus game against each other! Well done!!! The concept of Meteos is simple. Drag Meteos blocks up and down until you get (at least) three of the same type in a row, horizontally or vertically. This causes a reaction that shoot those Meteos blocks (and all Meteos blocks sitting on top of them) up into the air. If you can shoot Meteos blocks high enough, they break orbit and head to the enemy planet as an attack. If too many Meteos blocks stack on top of each other, they'll become too heavey and crush your planet's crust. The most fun will be had be people who set small goals while playing video games, particularly video games in the Puzzle genre. The first time I played Meteos, I downloaded a demo from a DS Download Station. I played it in the store and liked it, so I closed my DS (put it into sleep mode, but not off) and went home. For three days, I kept my Nintendo DS on, in sleep mode, and plugged in whenever I wasn't playing Meteos. I don't remember what goal I was trying to achieve that day, but I remember that I made a series of bad decisions and was so upset with myself, I turned my Nintendo DS off. Totally off. No more Meteos. Within two weeks, I'd bought the game and picked up where I left off. I play this game to this day, even after unlocking everything unloackable in the game.